Barker, this Dreamy Eyes stuffed seal, is ready for hours of fun and adventure along with lots of cuddling and snuggling. 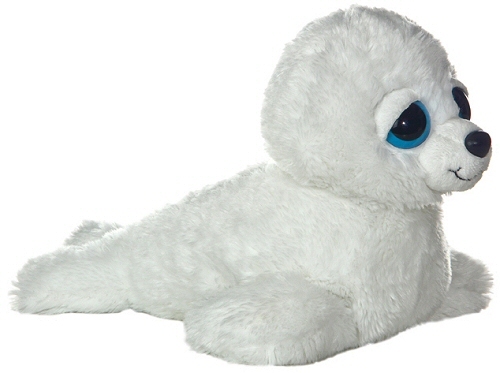 Plush Barker Seal has soft white fur, fun floppy fins, and big sleepy blue eyes in an oh-so-sweet smiling face. And there's no need to worry about this stuffed seal making a big, watery mess... this plush seal is the perfect pet and desires only to please. This adorable little stuffed harp seal has wonderfully soft white fur, wild whiskers, and a sweet face.